Nice, France — A petty thief and brawler who plowed a mile-long path of horror through Bastille Day celebrations on Nice’s seafront had no known connections to terrorist groups, a French prosecutor said Friday as investigators scrambled to piece together whether the attack that claimed 84 lives was directed by Islamist militant networks. If we will not call this terrorism, do we not understand the meaning of terrorism? If this is the true definition of terrorism, then whether it was an Islamic terrorist attack or terrorism of a crazed French lunatic, it was terrorism. I believe that “dictionary.com” has the correct meaning of the word, so why can’t Country leaders get it right? 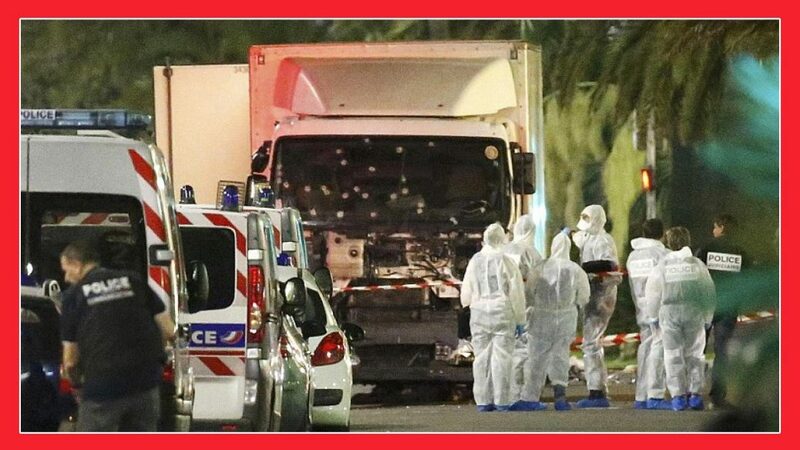 The scale of the carnage wrought by a man authorities identified as 31-year-old Tunisian immigrant Mohamed Lahouaiej Bouhlel came into grim focus Friday, with 10 children among the dead and 202 people injured. Among the wounded, 50 were “between life and death,” according to French President François Hollande. Children, elderly and the defenseless were murdered for what? The identities of the victims testified to France’s diverse society and to the international appeal of the tony French Riviera. A vacationing father and his 11-year-old son from Lakeway, Texas. A headscarf-wearing Muslim woman who came to celebrate Bastille Day with her nieces and nephews. A French high school teacher, his wife, daughter, and grandson. Others were from Russia, Switzerland, Germany, and Australia. There were so many victims early Friday that survivors grabbed tablecloths from seaside cafes to cover the bodies strewn across the asphalt. The dead were marked by rectangular orange and white traffic-control barriers that stood like rows of tombstones. Prime Minister Manuel Valls on Friday drew a strong link to terrorism, despite the fact that no militant group had claimed responsibility for the attack and Bouhlel had no known ties to such organizations. “The threat of terrorism, as we have now been saying for a long time, is weighing heavily on France, and it will continue to do so for a long time yet,” Valls said after an emergency meeting in Paris. “We are facing a war waged on us by terrorism.” So if a city mayor gets it, why don’t Country leaders, prime ministers, and Presidents? French citizens are clearly reaching their limit. Valls and Hollande — whose popularity is scraping record lows — were booed when they visited the seaside scene of the attack Friday, in an apparent sign of anger over security lapses. France was shaken by a terrorist attack in January 2015, when militant Islamist attackers took aim at the Charlie Hebdo newspaper and a kosher grocery store in Paris. Attackers struck again in November in a popular nightclub district of the capital, setting off bombs and raking the area with gunfire. Is it not time that we called for a war against Terrorism, using all available weapons, intelligence, and technology? No longer can citizens whether of the French Paris, the English coasts, the American suburbs, or the Middle Eastern shores, there needs to be a war, unlike a war in many years. This is not to control in a small area, but to eradicate all Terrorism around the world in whatever means that it will take. The time that America stood up and defended its shores, and international safety of its citizens.